HELMAND, Apr. 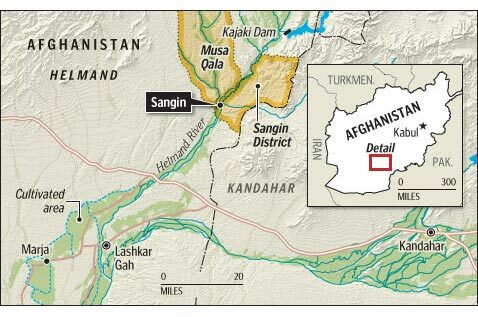 08 – The large number of enemy troops that arrived at Shakar Shela region’s Eid Gah area and Station desert, Sangin district, for a clearing operation about two days earlier were engaged by Mujahideen with heavy and light arms at 09:00 pm last night. The attacks from multiple axis on enemy troops lasted for about one hour in which 25 hirelings including 2 commanders were killed and wounded before the rest fled to the Corps HQ. Officials say that the enemy has left behind the bodies of multiple gunmen whereas the Mujahideen have also seized a RPG launcher, 6 US machine guns, MK19 grenade launcher, US rifle and a sizable amount of other equipment. All praise is due to Allah alone, no Mujahideen were harmed in the fighting.